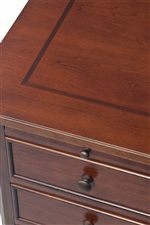 Upgrade your filing abilities with this stylish 3 drawer locking lateral file. The Canyon Ridge Transitional 3 Drawer Lateral File with Lock by Winners Only at Crowley Furniture & Mattress in the Kansas City Area: Liberty and Lee's Summit, MO & Overland Park, KS area. Product availability may vary. Contact us for the most current availability on this product. Storage 3 file drawers, one of which has a lock.